There are 012 Seychelles Outer Islands. They comprise 170 square miles of land in 150,000 square miles of open ocean. The islands have been known for a land time, and have been under the political control of many nations. Between 1778 and 1820 they changed hands seven times. Great Britain kept detainees on the islands, including Archbishop Makarios of Cyprus from September 1956 to March 1957. The Seychelles Outer Islands became independent June 29, 1976. 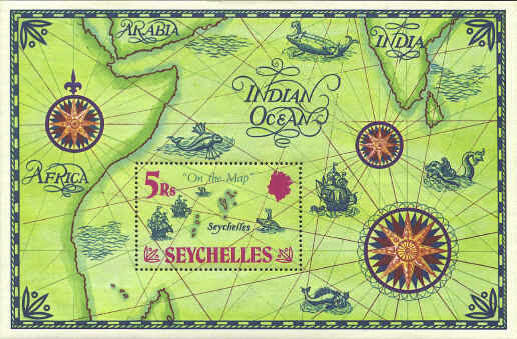 Their location in the Indian Ocean is shown on the souvenir sheet issued in 1971. The Solomon Islands are located in the Pacific Ocean east of Papua. Until 1978 they were a British Protectorate. In 1978 they became an independent state in the British Commonwealth. The stamp is part of a set of three stamps issued in 1969 by Fiji to commemorate the 25th anniversary of the Fiji Military Fortresses campaign in the Solomon Islands and of the posthumous award of the Victoria Cross to Corporal Sefania Sukanaivalu.